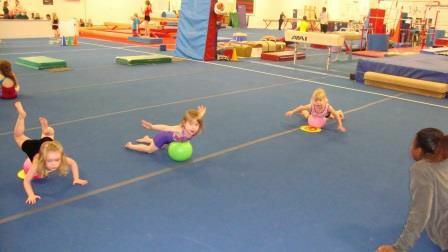 Our Kindergym program follows a curriculum designed to help the young child strengthen vital developmental skills. It is a structured class which helps the children learn basic skills on all the apparatus in the gym - vault, rings, bars, beam, floor and trampoline. 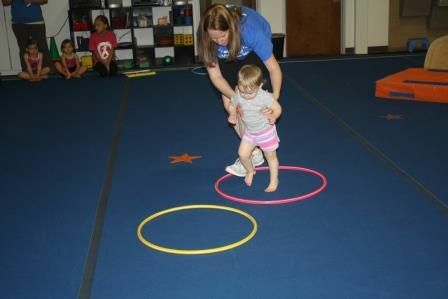 We also incorporate motor development stations into the class to help our young champions practice their fine and gross motor skills through fun activities. We have specially designed equipment that is created for children at this age. Our large open viewing area helps you to see and hear everything that is happening in the class. Student / Teacher ratio is 6:1 with 3 year old classes, 7:1 with 4-5 year old classes. If children are ready for an independent program, we will place them in a class that is appropriate to their age and level. We have a set curriculum of skills designated for levels 1 & 2 and will only advance a child when we feel they are ready. It is crucial that children master important developmental skills to provide a strong foundation for any sports activity that they may pursue as they get older.